Lannan is walking his way into a big inning...for them. very nice turn by the young guys. Dem boyz can turn a DP. If you don't admit that the guy pitches like Jekyll and Hyde, then you must be his real-life girlfriend. WTF Lannan! Get your crap together while you're in the dugout. oops, I forgot. You're batting thanks to he-who-should-be-DFAd. I think Morgan attempted that steal out of spite, for batting him 8th, which is another reason for getting rid of him. It doesn't take haterade to see that Lannan is an awful hitter. If the Nats win the world series, I'll get a flat top. ID nearly beat that throw. I have a Lannan fro coming in right now. I pity the fool that can't throw strikes. ... somebody mention Dunn's defense? 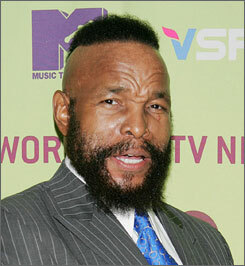 Wow, Mr. T got old !!! It's our time boyz !! Bottom of the 4th !! !